I enjoy teaching others when scheduling permits - if you're in the Southern California area I can be available for consulting / speaking engagements. This can range from the simple to complex - from simple instruction to more complicated project workflow issues. My primary areas of expertise include 3ds Max, VRay, Photoshop, and After Effects and how they create an efficient process for visualization. 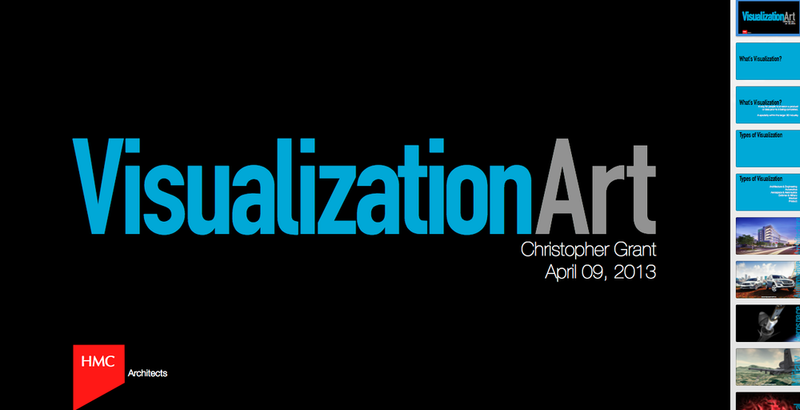 I'll be speaking at CBU to some of their Architecture, Visual Arts & Design students about how visualization is applied in different fields. I'll put an emphasis on the architectural application and show before & after breakdowns of stills & animation work. Thursday night, May 24, 2012 I'll be presenting advanced compositing & animation workflow with Francisco Penaloza at the 3DinOC meetup. Specifically we'll be discussing our workflow for the Taiwan Tower competition animation. The 3DinOC meetup is a new Orange County meetup of 3D artists and is currently hosted at the Microsoft Store in Mission Viejo. Next week I'll be sharing how 3D tools are used in Architectural visualization to several 3D Graphics classes at Eleanor Roosevelt High School. I'll be covering this specific niche in detail but also showing examples of how 3D is used in gaming & visual effects. I'll also be introducing the students to some highly successful channels on YouTube and training on VideoCopilot. EDIT - Presentation notes have been attached as a PDF here. This past Thursday night I had the opportunity to present some of my recent work and rendering techniques to the San Diego 3ds Max User Group http://members.cox.net/sd3dsmug/sdmaxug.html ... I've actually been going to the San Diego meetings periodically since the mid 90's or so ... I'm going to try and put some more material together and present again in another couple months.